Start off your visit on the 24th (Thu): see exotic creatures in open habitats at a safari tour and then identify plant and animal life at Kopara Reindeer Park. To find maps, more things to do, and other tourist information, you can read our Luosto online road trip planner . Kuala Lumpur, Malaysia to Luosto is an approximately 23-hour flight. Traveling from Kuala Lumpur to Luosto, you'll gain 6 hours due to the time zone difference. Plan for cooler temperatures traveling from Kuala Lumpur in October, with highs in Luosto at 3°C and lows at -2°C. Finish your sightseeing early on the 24th (Thu) to allow enough time to drive to Inari. On the 25th (Fri), surround yourself with nature on a nature and wildlife tour, gain a rich perspective with The Sami Cultural Centre Sajos, and then pause for some serene contemplation at Pielpajarvi Wilderness Church. For reviews, photos, where to stay, and more tourist information, use the Inari trip builder website . You can drive from Luosto to Inari in 3.5 hours. Alternatively, you can take a bus. In October, daily temperatures in Inari can reach 3°C, while at night they dip to -2°C. Wrap up your sightseeing on the 25th (Fri) to allow time to travel to Levi. Discover out-of-the-way places like Nature & Wildlife Tours and Giewont Husky Adventures. Venture out of the city with trips to Pallas-Yllastunturi National Park (in Muonio) and Seven Fells Up (in Akaslompolo). The adventure continues: stop by Elan Ski Shop & Rental. For traveler tips, more things to do, where to stay, and other tourist information, you can read our Levi driving holiday planning site . You can fly from Inari to Levi in 3 hours. Other options are to drive; or take a bus. In October in Levi, expect temperatures between 3°C during the day and -3°C at night. 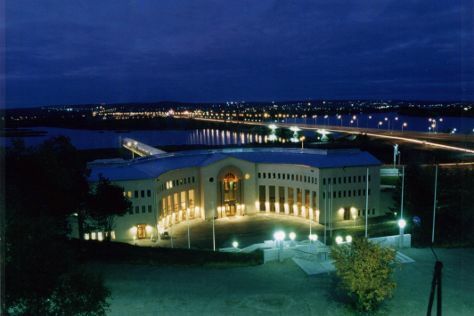 Finish your sightseeing early on the 28th (Mon) so you can drive to Rovaniemi. Step off the beaten path and head to Feelapland and Lumberjack's Candle Bridge. Bring the kids along to Santa Claus Village and Pilke Science Centre. There's lots more to do: get engrossed in the history at Arktikum, see Santa Claus Office, stroll the grounds of German Soldier s Cemetery, and browse the collection at Rovaniemi City Library. To see other places to visit, reviews, more things to do, and more tourist information, read our Rovaniemi online vacation maker . Traveling by car from Levi to Rovaniemi takes 2.5 hours. Alternatively, you can take a bus. Expect a daytime high around 3°C in October, and nighttime lows around -1°C. Wrap up your sightseeing on the 31st (Thu) to allow time to travel back home.